For other uses, see Red Square (disambiguation). Red Square (Russian: Кра́сная пло́щадь, tr. Krásnaya plóshchaď; IPA: [ˈkrasnəjə ˈploɕːətʲ]) is a city square (plaza) in Moscow, Russia. It separates the Kremlin, the former royal citadel and currently the official residence of the President of Russia, from a historic merchant quarter known as Kitai-gorod. Red Square is often considered the central square of Moscow since Moscow's major streets, which connect to Russia's major highways, originate from the square. 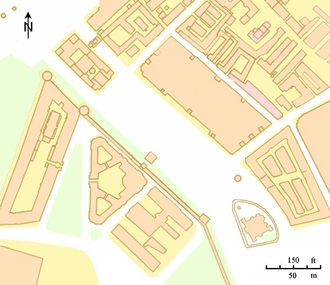 The East side of the Kremlin triangle, lying adjacent to Red Square and situated between the rivers Moskva and the now underground Neglinnaya River was deemed the most vulnerable side of the Kremlin to attack, since it was neither protected by the rivers, nor any other natural barriers, as the other sides were. Therefore, the Kremlin wall was built to its greatest height on this side, and the Italian architects involved in the building of these fortifications convinced Ivan the Great to clear the area outside of the walls to create a field for shooting. The relevant decrees were issued in 1493 and 1495. They called for the demolition of all buildings within 110 sazhens (234 metres) of the wall. From 1508 to 1516, the Italian architect Aloisio the New arranged for the construction of a moat in front of the Eastern wall, which would connect the Moskva and Neglinnaya and be filled in with water from Neglinnaya. This moat, known as the Alevizov moat having a length of 541 metres, width of 36 metres, and a depth of 9.5–13 m was lined with limestone and, in 1533, fenced on both sides with low, 4‑metre thick cogged brick walls. Three square gates existed on this side of the wall, which in the 17th century, were known as: Konstantino-Eleninsky, Spassky, Nikolsky (owing their names to the icons of Constantine and Helen, the Saviour and St. Nicholas which hung over them). 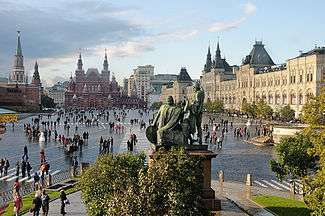 The last two are directly opposite Red Square, while the Konstantino-Elenensky gate was located behind Saint Basil's Cathedral. In the early 19th century, the Arch of Konstantino-Elenensky gate was paved with bricks, but the Spassky Gate was the main front gate of the Kremlin and used for royal entrances. From this gate, wooden and (following the 17th century improvements) stone bridges stretched across the moat. Books were sold on this bridge and stone platforms were built nearby for guns – "raskats". The Tsar Cannon was located on the platform of the Lobnoye mesto. 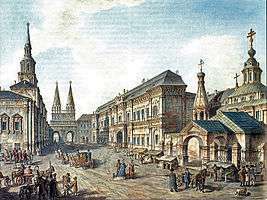 The square was called Veliky Torg (Great market) or simply Torg (Market), then Troitskaya by the name of the small Troitskaya (Trinity) Church, burnt down in the great fire during the Tatar invasion in 1571. After that, the square held the name Pozhar, which means "burnt". 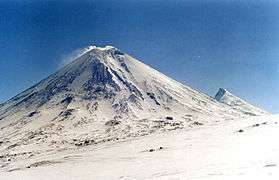 It was not until 1661–62, when it was first mentioned by its contemporary Krasnaya – "Red" name. Red Square was the landing stage and trade centre for Moscow. 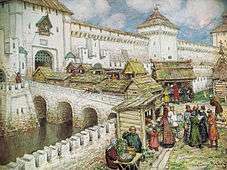 Ivan the Great decreed that trade should only be conducted from person to person, but in time, these rules were relaxed and permanent market buildings began appearing on the square. After a fire in 1547, Ivan the Terrible reorganised the lines of wooden shops on the Eastern side into market lines. The streets Ilyinka and Varvarka were divided into the Upper lines (now GUM department store), Middle lines and Bottom lines, although Bottom Lines were already in Zaryadye). Red Square was considered a sacred place. Various festive processions were held there, and during Palm Sunday, the famous "procession on a donkey" was arranged, in which the patriarch, sitting on a donkey, accompanied by the tsar and the people went out of Saint Basil's Cathedral in the Kremlin. 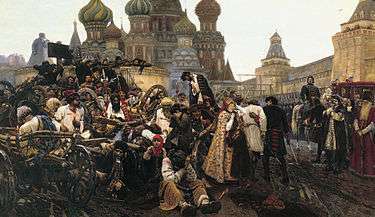 During the expulsion of Poles from Moscow in 1612, Prince Dmitry Pozharsky entered the Kremlin through the square. In memory of this event, he built the Kazan Cathedral – in honour of the Kazan Icon of the Mother of God, followed his army in a campaign. At the same time (1624–1625), Spasskaya tower received contemporary tent roofs. This was done on the proposal and the draught of Christopher Galloway from Scotland, who was summoned to design the new tower's clock and suggested the arrangement of the tent roof over the clock. In the mid-century a gilded double-headed eagle was set on top of the tower. 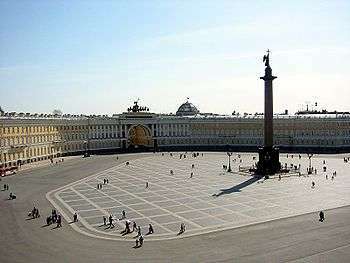 After this, the square became known as Krasivaya ("beautiful"). In the late 17th century (1679-1680) the square was cleared of all wooden structures. Then all Kremlin towers received tent roofs, except Nikolskaya. One tent was erected on the wall above Red Square (the so‑called Tsarskaya Tower, so that the tsar could watch from this spot the ceremonies in the square). Tent roofs were also constructed at Voskrerensky (Iberian) gates, arranged in the wall of Kitai-gorod. These were the fortified gates at Voskresensky Bridge over the River Neglinnaya. 17th century Palm Sunday procession leaving Saint Basil for Kremlin. 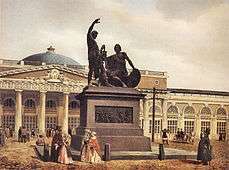 In 1702, the first public theatre in Russia was built near the Nikolsky gate; It stood until 1737, when it was destroyed in a fire. 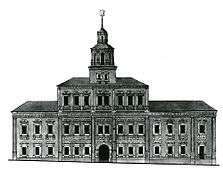 In the 1730s, a new mint building, called the Gubernskoye pravlenie (Provincial Board), was built in front of the old one. The Kremlin with Alevizov moat and Nikolskaya Tower in front. By Fedor Alekseev, 1800. Left-right: market lines by Bove, Saint Basil and Kremlin. View from 1816. Market lines were replaced by GUM store in 1893. Red Square with St. Basil's Cathedral and Moscow Kremlin in background, by Fedor Alekseev, 1801. During the Soviet era, Red Square maintained its significance, becoming a focal point for the new state. Besides being the official address of the Soviet government, it was renowned as a showcase for military parades from 1919 onward. Lenin's Mausoleum would from 1924 onward be a part of the square complex, and also as the grandstand for important dignitaries in all national celebrations. In the 1930s, Kazan Cathedral and Iverskaya Chapel with the Resurrection Gates were demolished to make room for heavy military vehicles driving through the square (both were later rebuilt after the fall of the Soviet Union). 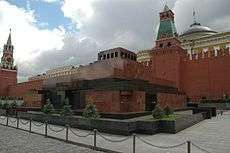 There were plans to demolish Moscow's most recognized building, Saint Basil's Cathedral, as well to make way for a larger Red Square, as well as the State Historical Museum. The legend is that Lazar Kaganovich, Stalin's associate and director of the Moscow reconstruction plan, prepared a special model of Red Square, in which the cathedral could be removed, and brought it to Stalin to show how the cathedral was an obstacle for parades and traffic. But when he jerked the cathedral out of the model, Stalin objected with his rather famous quote: "Lazar! Put it back!". Two of the most significant military parades on Red Square were November 7, 1941, when the city was besieged by Germans and troops were leaving Red Square straight to the front lines, and the Victory Parade in 1945, when the banners of defeated Nazi armies were thrown at the foot of Lenin's Mausoleum. 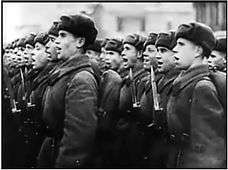 The Soviet Union held many parades in Red Square for May Day, Victory Day, and the October Revolution, which consisted of propaganda, flags, a labour demonstration, and a troops march and show off of tanks and missiles. On Victory Day in 1945, 1965, 1985, 1990, and 2015 there were military marches and parades as well. In 1963 a group of African students organised a protest on Red Square in response to the alleged murder of a medical student Edmund Assare-Addo. This was the first recorded political protest on Red Square since the late 1920s. On May 28, 1987, a West German pilot named Mathias Rust landed a Cessna 172 light aircraft at St. Basil next to Red Square, causing a major scandal in the Soviet Air Defence Forces. 360° Panorama of Red Square: Saint Basil (direction: SE), Kremlin with Lenin Mausoleum (from 1930) in front, State Historical Museum (NW) and GUM store. Hardly seen are Voskresensky gates just to the right of museum, Kazan Cathedral just to the left of GUM store and the Minin-Pozharsky monument in front of Saint Basil (originally it was in front of GUM store). The buildings surrounding the Square are all significant in some respect. Lenin's Mausoleum, for example, contains the embalmed body of Vladimir Ilyich Lenin, the founder of the Soviet Union. 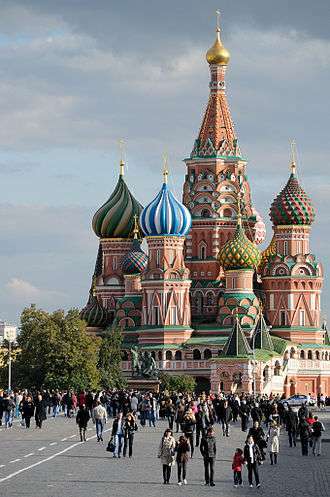 Nearby to the South is the elaborate brightly domed Saint Basil's Cathedral and the palaces and cathedrals of the Kremlin. The Kremlin and Red square were together recognised as a UNESCO World Heritage Site in 1990, due to their inextricable links to Russian history since the 13th century. ↑ Julie Hessler. "Death of an African Student in Moscow". CAIRN.info. Retrieved 15 July 2014. ↑ Aksyonov, Pavel (January 21, 2008). "Tanks to return to Red Square". BBC News. Retrieved June 14, 2009. ↑ Chance, Matthew (May 9, 2010). 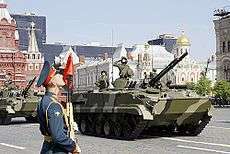 "Western troops join Russia's Victory Day parade". CNN. Retrieved May 9, 2010. Wikimedia Commons has media related to Red Square.